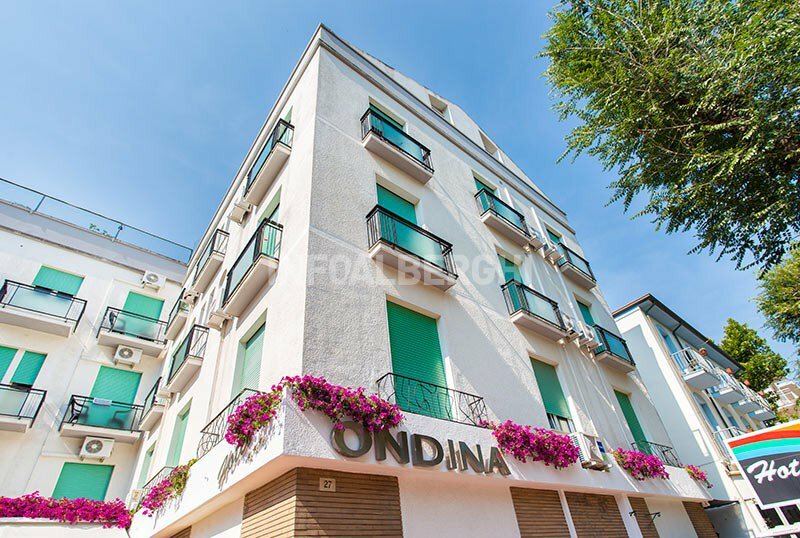 Hotel Ondina is a 3-star family-run Cattolica hotel located near the center and the beach. It is located in a quiet area, has a garden with games for children and has an agreement with the beach where there are gym, swimming pool and Jacuzzi. Accepts pets of all sizes. 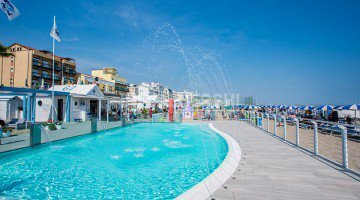 The hotel is located in Cattolica, a few minutes from the beach and about 5 minutes walk from the square 1 Maggio, with the dancing fountains. A short distance away is the bus stop, with which you can reach the main points of interest in the area, including the Aquarium of Cattolica and discos. The train station is about a 15-minute walk away. All rooms have air conditioning, free WI-FI, safe, telephone, TV (digital terrestrial and satellite), minibar, bathroom with hairdryer and shower box in masonry with curtain. Some have a balcony and cleaning takes place every day. Equipped garden, free use of bicycles, reading room with newspapers, lift. PARKING: located 800 meters and connected to the hotel by a 24 hour shuttle service. WI-FI: available for free throughout the entire hotel. PETS: accept animals of all sizes. BREAKFAST: international buffet, served in the garden with homemade cakes and pies, pies, juices, yogurt, croissants and savory foods. LUNCH AND DINNER: the restaurant serves traditional dishes based on meat and fish. Meals are always followed by a buffet of vegetables, salads and fruit. Pasta and desserts are homemade. VARIATIONS: menu suitable for vegetarians. Dishes with gluten free products on request. In hotel: indoor and outdoor playground area with slides and swings, bottle warmer. Upon request: baby sitter and pediatrician. At meals: baby menu, seats at the table, baby food and a kitchenette for parents. The restaurant offers flexible meal times. On the beach: playground, baby / mini / junior club, swimming pool and entertainment service. The hotel has an agreement with the equipped beach "I Delfini Beach Village". It has a gym, swimming pool with Jacuzzi, basketball courts, table football and ping-pong tables, entertainment activities for adults and children. The prices of the price list are per person per day for a stay min. of 7 nights. The price of beach service varies depending on the period and duration of stay. TOURIST TAX: Excluded from the price list. € 1.00 per day per adult for a maximum of 7 days (children up to 14 years free). FULL BOARD: Full board + water, soft drinks and local wine with main meals, secure and secured car park, bicycles and tandems available, swimming pool on the beach, WI-FI. ALL INCLUSIVE: Full Board + Beach Services (1 umbrella and 2 sunbeds starting from the 4th row) to be paid directly at our partner bathing establishment. For bookings before 28/02/2019 same price 2018! Full board from € 39 per day per person.